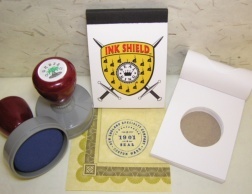 Our high quality custom embossers are a stylish alternative to traditional labels and address stamps. Embossed impressions add an old-world, personal touch to invitations, cards, letters, books, packaging or gifts. 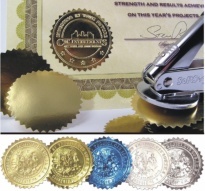 Other examples of uses for embossers include corporate identity seals, notary seals, professional engineer and architect seals, fine art print chop marks, certificate seals and state seals. We also specialize in exquisite wax seals engraved in solid brass, copper or marble. Choose from our designer layouts customized with your wording, or provide us with your own custom artwork. Our professional, experienced customer service and art department work together with you to create the highest quality custom embosser or wax seal available. We can create a beautiful Wax Seal with any artwork or design. Beautifully Engraved for Quality and Detail. 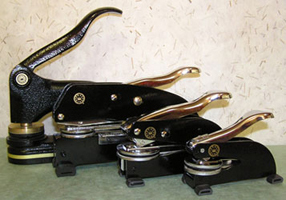 Own one of a very limited number of genuine antique cast iron embossers from the late 1800�s to the early 1900�s. We can also repair or refit a die on your antique embosser. Available for all 50 States.Choose from an embosser or rubber stamp. Just add your information to the order form. On Sale! Starting at $25.98. One Day Service, Free Shipping! Automatic embossers for the ultimate in convenience and durability. Will not crack or fall off. Available in over 30 colors. Engineer Seals & Engineer Rubber Stamps.